Who says Soap Operas aren’t real life? Have you heard of the Casey Anthony trial? Talk about dramatic twists and turns!! In case you haven’t heard, here’s a quick summary: Casey Anthony is accused of killing her young daughter, Caylee Anthony, then proceeding to tell lie after lie after lie. I haven’t been paying attention to every detail, but I know there are those of you who have, so this is for you. I would love to hear your comments and opinions on the whole ordeal. In the meantime, we’ll rely on a friend of mine with quite a bit to say. Please note that my friend is a lay-person watching the trial and is in no way personally connected to the trial, nor can she be considered an expert. She’s merely stating her opinion. Please state yours in the comments. 1. Caylee drowned in the swimming pool, says defense. First of all, anytime the “defendant claims” anything, it should give one a time for pause, if one is smart. Casey Anthony has lied so many times I don’t think she even knows all the lies she’s told. I can understand Caylee dying by accident (like maybe too much chloroform? ), but Casey’s actions before, during and after Caylee went “missing” tends to make me feel she really didn’t care. It was more important for Casey, a mother (cough, puke), to hang out and party with her friends, after stealing their money to buy herself some new clothes. 2. Casey was sexually abused, says defense. There are many survivors of sexual abuse in our midst. How many of them have lied every day for a month, stolen money from friends and family, partied all the time, lived at home with their parents, had no job, seemed to be on a constant look out for “boys” each time they went out, and allegedly killed their only child? 3. The murder weapon: duct tape? I saw most of the Prosecution’s Opening Statement and I never got the sense she was implying the duct tape was the murder weapon. Perhaps it was an accessory to the crime, but not the sole cause of death. Odd how Jose Baez, in his Opening Statement, said the tape found on Caylee was the same tape found in the gas cans George owns. I kind of agree with Drane-Burdick. The jury should have no problem concluding Caylee Anthony was killed by her mother. This I say from the shoddy job Baez did with his opening statement and questioning of the first Prosecution witness, George Anthony. 4. Meter reader hid Caylee’s body, defense claims. So how did Kronk ever get in touch with Caylee, when Caylee was last seen with her mother, Casey? It may be Kronk tried to make a fast buck for himself, given his role in this tragedy, but there’s been no evidence, circumstantial or otherwise, that would support Defense claims. 5. Caylee’s grandparents knew she was dead all along, defense says. In his opening statement, Baez said Caylee’s death was an accident and she was afraid of telling her parents about it. Yet Baez is putting it out there that George knew about it? That makes no sense to me, and although I’m not a legal eagle, I’ll call bullsh*t when I see it. Bullsh*t! The Defense is grasping at straws, throwing anything up to see what might stay up. I don’t know a whole lot about Jose Baez, but he may have been chosen by Casey to defend her (from a couple of inmates who vouched for him, as per one of her jail house visit videos with her brother, Lee). I don’t believe Baez has had any major cases in his professional career and the Casey Anthony Trial will sure put him front and center, but not in a way that’s flattering or admirable. So what do you think? 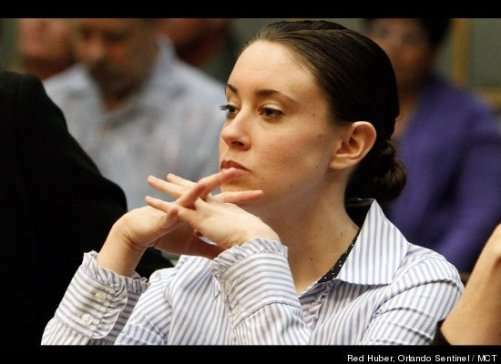 Is Casey Anthony going to be locked away for the rest of her life? Or do you think something will happens and she’ll slip through the cracks of justice? The only thing for certain at this point is that Caylee Anthony’s loss of life at such a young age is a pure tragedy. previous post: Lindsay Lohan Drunkenly Grabs Random Chick’s Wrist. Allegedly. I think the father did it because he was messing around with calee.So he didnt call 911 because people would find out what he was doing to the little girl. 53 queries in 0.681 seconds.